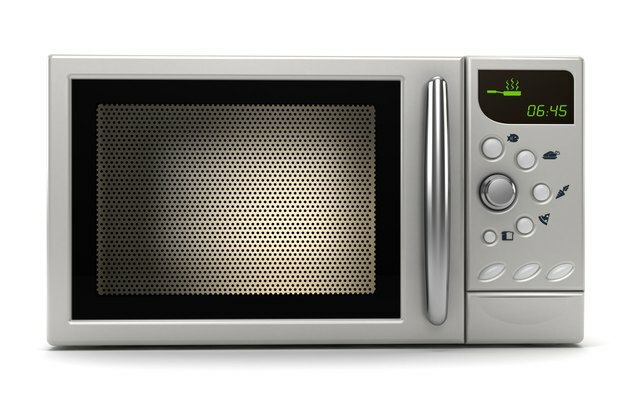 The main component of a microwave is the magnetron, a electromagnetic device that generates the microwaves which cook your food. But it isn't the only electrical device inside the cabinet. If you remove the cover, you'll find a light and a drive motor that operates the turntable, as well as a pair of transformers, several switches and fuses and a capacitor to amplify the voltage to the magnetron. Any of these components can be responsible for malfunctions, although fuses and switches are the most likely culprits. You don't always have to remove the cover to troubleshoot a problem, but if you do, the first thing you should do is discharge the capacitor. The charge between the terminals of a fully charged capacitor can be 2,000 volts or more, and that's enough to cause serious injury. If your microwave won't power on, the very first thing to check is the plug. Is it plugged in, and if so, has the outlet, itself, tripped? You should also check the breaker in the panel to make sure it hasn't tripped. Once you've verified that you have power, push the door closed with a little extra force to make sure the door switch has engaged. If nothing happens, and the door latch seems operational, it's time to remove the cover to check the switches and fuses. If the unit has power, but you hear loud noises when it's working, you may have to replace an internal component, such as a transformer or the magnetron, but the sound could also be coming from the turntable. Make sure nothing is restricting its movement. Once you've done that, it's time to remove the cover. Unplug the unit, loosen the screws holding the cover and slip it off by grasping it and pulling it up and away from the front of the unit. The function of the capacitor is to increase the voltage to the magnetron, and it holds a charge even when the unit is unplugged. The simplest way to do this, and the one recommended by many manufacturers, is to hold the blade of an insulated screwdriver to one of the capacitor terminals and tilt the screwdriver until it contacts the other terminal and hold it in this position for a few seconds.. You'll hear a startling pop as the capacitor discharges. After you're done, ground each terminal by touching the screwdriver to it while the screwdriver shaft contacts any exposed metal part on the microwave chassis. If the capacitor has three terminals, short each terminal to the other two before grounding it. Use a voltmeter to make sure the capacitor voltage is zero before proceeding with repairs. Switch malfunctions are among the most common problems. These are small rectangular plastic components soldered to the control board. Remove the connector from each one and clean the prongs with alcohol, then replace the connector and double check to make sure it makes contact. After checking all the switches, plug in the unit and check for power. Still nothing? One or more switches may be bead, but to perform a continuity test to verify this, you'll have to desolder each switch from the board. If you decide to do this, don't forget to discharge the capacitor again. A number of fuses inside the chassis protect the circuitry from short circuits and other current surges. After discharging the capacitor, check each one and replace it if it's discolored or obviously blown. Each fuse is a one-inch ceramic or glass cylinder with metallic ends, and it's usually inside plastic holder that you separate by twisting counterclockwise. When a fuse blows, it's usually because another part, such as a switch, has malfunctioned. Problems caused by mechanical issues are usually easier to diagnose and fix. For example, if the door won't close, the problem may be that something has gotten stuck inside the latch mechanism or the spring has broken. When you have to service the door latch, it's best to have the users manual handy to help you. The same is true if you have to service the drive motor for the turntable or the belt that connects them. If your microwave sparks when you turn it on, that probably isn't an electrical problem. The sparks are usually caused by the microwaves reflecting off of a metal utensil or container inside the oven compartment. Remove the metal and the sparks will stop. If you can't diagnose and correct a problem yourself in an hour or two, it probably isn't worth your while to continue. Some issues, such as the failure of the oven to supply heat, are due to problems with key components, such as the magnetron or capacitor. Diagnosing these issues is a job for a pro.